The Königssee is a lake located in the extreme southeast of the German State of Bavaria (Bayern), near the German-Austrian Border. Lying near the Bavarian town of Berchtesgaden in the municipality of Schönau am Königsee, just south of the Austrian city Salzburg in the German Alps, the Königssee is the third deepest lake in Germany. The lake was formed by glaciers during the last ice age. It is 7.7 kilometers long and about 1.7 kilometers across at its widest point. Except at its outlet, the Königsseer Ache at the village of Königssee, the lake is surrounded by steeply rising flanks of alpine mountains (2.000 m), including the fabled Watzmann. A subcamp of the Dachau concentration camp was located nearby. The literal translation appears to be King's Lake, but this is not correct. 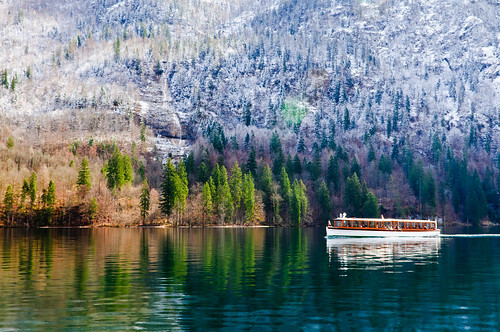 While König does indeed mean king, the name of the lake comes from the first name Kuno, which appears in several historical sources, and it was formerly called Kunigsee. The lake is noted for its clear water and is advertised as the cleanest lake in Germany. For this reason, only electric driven boats, rowboats and pedal boats have been permitted on the lake since 1909. The lake and surrounding parklands are very popular with tourists and hikers. In addition, the lake's position surrounded by mountains creates an echo, which is known for its clarity. On boat tours, it has become traditional to stop and play the trumpet to display the echo.